Just confirmed on C4 - broken lower leg for the mechanic. Bit disappointed with Bottas there, especially after his great start. He was clearly faster but seemed to have forgotten how to overtake. If that had been Hamilton he would have taken him. Good driving by Seb to eke it out. He should've been all over Bottas. With 5 laps to go, Bottas was lapping 134.6, Seb was 135.6, with a three second gap. Bottas should have had DRS for at least two laps. For last two laps, Bottas was lapping 136s, and barely getting DRS. Bottas choked, doesn't know how to pass or doesn't have the killer instinct, or all three. Bottas was completely happy with a second place finish. That's also a lot down to the Mercedes dirty air issues. Sky say the Ferrari mechanic broke his leg. Not going to show the footage as it's pretty graphic. Congratulations to Vettel for an amazing win, BUT Vettel should be very, very harshly fined for the accident with the mechanic (and unsafe release). In addition, after today and last week's incident, the FIA should look at every team's tyre change and release procedures and ensure they are as safe as possible. IF, Vettel's claim that his tyres were shot for the last 10 laps then that doesn't bode well for Mercedes. Hope the mechanic gets well soon. Also, depends what happened. If the light went green, there's no fault from the driver. I'm sure the light was green. I checked. 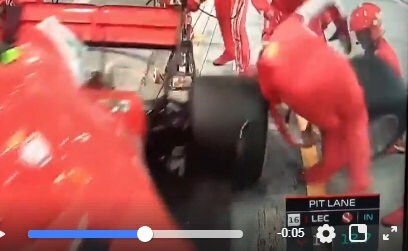 Yep, light was green, and as mentioned, just by looking at the slow mo of the pit stop, leg is broken just below knee. Kimi was fuming inside the car once he stopped, he has closing in on Bottas before the stop. To be honest he should have had him anyway. Hamilton would have made that move stick IMO. Max, ALO, RIC, HAM all make that move on the last lap. Bottas bottled that, and Merc will remember it. Strong drive from Vettel, fair play to him. Very watchable race that one. Attack on Vettel came too late. I’ve said it before but I think Mercedes are strategically vulnerable when the pressure is on. Governed entirely by timing screens and not what’s actually observable on track. The race was there to be won today and they dropped it. I agree, bottas should have put pressure on vettel earlier. not sure what the issue was that he left it too late. Just shows that you don't need overtaking for the race to be good. Differing strategies gave us all the excitement in that race. Yeah I hope we get some news to say the mechanic is OK soon. Ferrari/Kimi should be penalized. Two unsafe releases over the weekend. I think it's time to scrap the automated traffic lights. The 2s pit stops are an impressive feat, but they are dangerous. Absolutely. I don't mind races with little overtakes, I still wouldn't miss a race. AND the racing is BETTER! Vettel whines about blue flags but hamilton says it and just as side note. More UK crap lets get some international flavor in it. Fernando chipping away - some updates and carnage away from title Rahal style. I'll be honest, Ferrari should have got Kimi back in the race. Herbert clearly doesn't remember dislocating Steve Marchetts shoulders. Bottas could've had five more laps and he still would have been behind Vettel. No way Mercedes is happy with Bottas right now, he can't get it done when it matters. Is it not possible to still service the car by pushing it backwards if it hasn't left the pit lane? Great race to the end. Of course Vettel holding Bottas off for the win with scrub tyres (and the memory of past blow outs at Ferrari and RBR when they risked a too long game) was icing on the cake, but it was pretty exciting all around with the different strategies, etc. Sad about the Ferrari mechanic being hit and breaking his leg; glad it wasn't worse. The team called it - they thought Ferrari was going to stop - even after Kimi being derailed. By the time they suggested to Bottas Seb might not stop again, he was nearly 8 seconds behind with 12 or so laps to go. So it was a hard ask for Bottas - and btw, same for Hamilton. He was depending on the stop from Vettel too until the same point, at which time he too started hauling. I've thought this for a couple of years now. Considering how many people they have analysising the race data they do seem to make plenty of strategy errors. If Ham and Bottas had started in swapped grid positions at the start of the race, Hamilton probably wins the race, but I don't think Merc had a faster car than Ferrari. Simply, the 2nd strategy option was way more effective than teams predicted, and that put pressure on Ferrari. Fortunately though, the Ferrari package is good enough, and their lead driver was good enough, to eke out the win and make the 1-stopper on the softs work. The strategies worked in a weird way this race with Merc effective on generally harder compounds and Ferrari effective on all compounds, and the medium 1-stopper proving very effective and working to Mercs advantage with Ferrari opting for a brave strategy choice to do the same but on the soft in the face of pressure they didn't necessarily expect according to the number crunching. Last edited by Invade on Sun Apr 08, 2018 5:29 pm, edited 1 time in total. Gasly had faster race pace than Hulk & Alonso. Still early days but I'm getting quite convinced Red Bull will switch to Honda next year. Weren't the 2 retirements today due to Renault engine? I knew Bottas was a useless driver, but jeez, that is a totally another level of incompetent driving. I know it was against a top, top, top drawer driver, but still. If Ham and Bottas swapped positions at the start of the race, Hamilton probably wins the race, but I don't think Merc had a faster car than Ferrari. Simply, the 2nd strategy option was way more effective than teams predicted, and that put pressure on Ferrari. Fortunately though, the Ferrari package is good enough, and their lead driver was good enough, to eke out the win and make the 1-stopper on the softs work. The strategies worked in a weird way this race with Merc effective on generally harder compounds and Ferrari effective on all compounds, and the medium 1-stopper proving very effective and working to Mercs advantage with Ferrari opting for a brave strategy choice to do the same but on the soft in the face of pressure they didn't necessarily expect according to the number crunching. How could they possibly swap the positions at the start of the race? Hamilton was never anywhere close to Bottas. Was Bottas to DNF at any stage of the race, it wouldn't make a difference whatsoever, Ham was never to win (unless something happened to Vet). One electrical failure and one diff I believe from the contact with Lewis. I thought he was underwhelming but damn - that's savage! I haven't heard about Ricciardo, but Max got his differential damaged in his dogfight with Hamilton. I mean if you replay the weekend and there's no gearbox problem and Ham qualifies in P3 and Bottas in P9. Obviously they can't swap positions - I didn't mean in the race. I'll edit it to make it clearer. Oh, I get it.. you meant, if Ham was the P3. I agree. The mechanics' safety should be taken just as seriously as the drivers', and these automated systems are demonstrably dangerous and have resulted in too many incidents of cars being wrongly released. Sadly his leg got twisted backwards. He's going to take some time to recovery. Wishing a speedy recovery. This just shows these cars at even slower speeds can cause damage. Motorsports can never be safe due to instances such as these. Yeah, I figured that out the moment I sent the replay. Horrid. That's not the direction legs go. That's not the main point of my post though. It's a precursor to the talk on strategy and car race pace. Well, I thought that that was indeed the main point here. Was Hamilton in the start position of Bottas (P3) he would had won the race. Because he is Hamilton and not Bottas. No what I'm saying is something like: Even though Hamilton probably would have won the race even from the second row, I don't think it means the Mercedes car had better pace in the race, but that the 2nd main strategy option was substantially better than predicted by the teams. Or that if teams matches strategies pace would prove equal. As it happened even a C-option (one stopper on softs) proved to be an effective if theoretically slower strategy, which is to the credit of the driver and the car. Good damage limitation from McLaren to get a double points finish out of this poor weekend. Vintage McLaren strategy for Alonso. McLaren 3rd in WCC and the leading Renault team. Amazing ! considering both Maccs got lapped today... goes to show how far ahead both Merc and Ferrari is ahead of the rest..
Amazing ! considering both Maccs got lapped today... goes to show how far ahead both Merc and Ferrari are ahead of the rest.. It is clear Bottas had the pace that when he went for it, he was catching at a second a lap! The dirty air will have been what made him look worse than he really was. And yet it was really close. I just think Mercedes calculated the number of laps this would take wrong. I agree as well. I'm usually not the first one to spout about safety over sport/show, but I really don't see any advantage to the show or in sporting sense for these automated systems. And I've been thinking the same way from the day they were introduced, not only now when something like this happens.